It’s Throwback Thursday so let’s go back through Upper Deck’s trading card history and come up with a fun giveaway. It is a big weekend for NFL playoffs and everyone is talking about the Dallas Cowboys vs. Green Bay Packers game. Aaron Rodgers and Tony Romo lead arguably two of the NFL’s best offenses- between each team’s running game and experience both look to be unstoppable. If Rodgers’ injuries stay out of the way and Jordy Nelson plays the way we all know he can, Packers will be quite the threat. But, Romo and DeMarco Murray are another dynamic that pose a strong offense against the Packers defense. Guess we will just have to wait and see! So let’s put up a throwback card and see if our fans can come up with some great captions for the card! Please share your comical caption to this card for a lucky fan’s opportunity to score 5 packs of 2014 SP Authentic Football! You have until Friday morning, January 9th at 8:00 a.m. PT to post your caption before this promotion is closed. I am proof that white men can jump! Were coming after you Dallas!!!! Only you can prevent the Cowboys from going any farther in the playoffs. Wow. That’s a cool camera! Go ahead… I dare you to touch that jersey swatch right there! 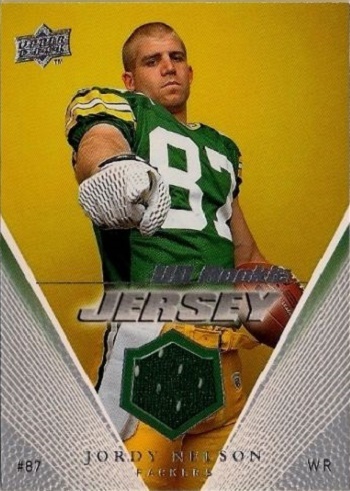 Uncle Jordy wants YOU for Packer Nation. Pass me that Wisconsin cheddar! YOU! Bring me a large pizza with pepperoni and a diet Coke! Dallas, YOU, better wear warm clothes when you come to our house! Oops, did I step on your leg? You better not bring your officials with you to Green Bay! See what that says! It says ud rookie jersey! Hey you! Are you the guy that cut off a piece of my jersey?! This new finger cam makes it easy to take great selfies! Hey suckers I’m coming for you. I’m gonna be the best. You’d better not pick up that penalty flag without a good explanation! Cause Baby you, You got what I need, but you say he’s just a friend. Can you smell what the “PACK” is cooking. I am a cheesehead! And you? Better watch out, better not cry, Jordy Neilson is coming to town!! I wish that said cowboys not packers under my name. No no Tony. Your doing it all wrong! This is how you hold for the place kicker man! YOU, sit right there. I am watching YOU! Now watch me catch some passes. Go Pack! Ok Ref you picked there flag up last week!! Now pick that one up for us!!! I WANT YOU . . . to tell me where my helmet is! I want to PUMP, you up!! And take down Dallas this Sunday!! DEZ BRYANT IS BETTER THAN ME! YOU DALLAS DEFENDERS BETTER NOT MAKE ME CRY LIKE NDAMUKONG SUH! I’m gonna come at you like a spider monkey! !